Our responsibility to the environment reaches every part of the extensive supply chain involved in the design, manufacture and distribution of our products. It goes far beyond this when electrical and electronic products reach the end of their lives and need to be disposed of in an environmentally-friendly way. The WEEE (Waste Electrical and Electronic Equipment) Regulations are UK laws that aim to minimize the impact of electrical and electronic goods on the environment. It covers any product with a plug or a battery, imposing several obligations on all producers of electrical and electronic equipment. It requires a high level of collection (including separate collection) of WEEE for treatment, recovery and environmentally sound disposal, so that the amount of WEEE going into landfill is reduced dramatically. Our compliance approach for each of these obligations is provided below. We are responsible for the disposal of end-of-life electrical goods in an environmentally friendly way. Our products are designed to ensure that all of our equipment can be dismantled and the components and materials are recoverable. All Moore Large subject products shipped from 13th August 2005 are compliant with the WEEE marking requirement. 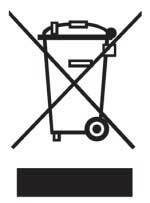 Such products are marked with the “crossed-out wheelie bin” WEEE symbol (shown, right) in accordance with European Standard EN50419. In accordance with the Regulations, the following user information is provided to customers for all Moore Large products subject to the WEEE directive. Moore Large complies with all legal requirements and has registered with the relevant authorities. Our unique compliance number is WEE/KC0260RZ . Moore Large will ensure that all information required by our compliance scheme will be provided in a timely manner. If any of Moore Large’s branded products are held by private households then any WEEE should be taken to a local Designated Collection Facility (DCF) for recycling. Visit www.recycle-more.co.uk to find your nearest DCF. We confirm that treatment and recycling of WEEE done on our behalf, is be carried out in accordance with all requirements of the WEEE Directive, including requirements in respect of special treatment for specific parts and overall recovery rates. We will provide information on re-use and treatment of each new type of WEEE placed on the market within one year. The information contained herein is subject to change without notice. Nothing herein should be construed as constituting an additional warranty. Moore Large shall not be liable for technical or editorial errors or omissions contained herein.